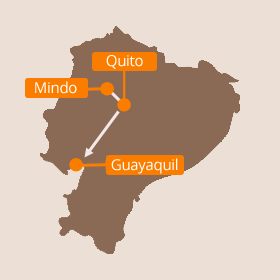 Ecuador produces some of the finest chocolate in the world, so we've planned a tour of Ecuador to let you experience the journey from bean to bar for yourself - with a few tasting opportunities along the way, of course! You will arrive in Quito today as your Ecuador holidays begin. We’ll be there to pick you up and take you to your hotel, which is in the heart of the capital. You will probably want some time to rest and get used to the altitude so we have left the rest of the day free for you to relax. Your hotel is close to dozens of restaurants and cafes, as well as all the other facilities you'd expect from a capital city, so if you're feeling up to it then why not head on out and explore one of South America’s most beautiful capitals. Ecuador boasts some of the best-preserved stretches of the whole Amazon rainforest, and it’s easy to add some time in the jungle on to any of our Ecuador holidays. We work with a range of the best jungle lodges in Ecuador so you can pick the one that’s right for you: some are best for wildlife, some for contact with indigenous cultures, while some offer unique attractions such as canopy walkways, so you can walk through the treetops for a unique birds-eye view of this amazing environment. Ecuador’s beautiful Pacific coast enjoys year-round Equatorial sunshine, so if you’d like to finish off your Ecuador holiday with some quality relaxation time, then a 5-day break at one of Ecuador’s loveliest beach hotels could be perfect. The trip begins with the flight south from Quito, giving you three full days on the beach, before we pick you up at the end of Day Five and take you back down the coast to the city of Guayaquil to board your international flight home. This superb 4-day train journey allows you to experience the whole of Ecuador’s newly-restored railway network, with a journey all the way from Quito in the north, through the Cotopaxi National Park and down the infamous “Devil’s Nose” switchback through to Guayaquil on the Pacific Coast. Vintage steam locomotives will take you through two of the sections, with fabulously comfortable coaches and overnight accommodation in boutique haciendas along the way. There’s simply no better way to experience Ecuador than this. Our standard price for this chocolate tasting holiday in Ecuador is £1200 per person, which is based on two sharing a double or twin room in our standard hotels and lodge. That price includes all your accommodation, internal transport, transfers, tours, guides and entrance fees, plus all your meals in the Cloud Forest and Guayas, and breakfast every day.